Innovative roofing work in Petaluma completed by Sutter Roofing and Sheet Metal. Regardless whether your Petaluma home is an historic treasure or practically new, Sutter Roofing and Sheet Metal is a roofing contractor serving Petaluma that is proud to combine modern technology with artful craftsmanship. 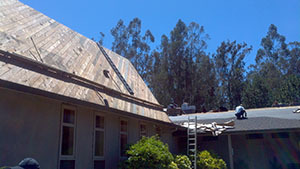 Our roofing company loves serving Petaluma with the well-built materials and artistry. From our beginning, our passion for quality roofing workmanship for our Petaluma clients has been part of our roofing company culture, and we have helped literally thousands of homeowners with their roofing needs around Petaluma. We are the roofing contractor with experience, and we know that excellence in workmanship is the most important component to a long lasting roof. Often our roofing company inspects roofing systems in Petaluma that should have lasted a lot longer, but due to low quality materials and poor craftsmanship, these Petaluma roofs are aging prematurely. Small details such as nail placement and sub-roof preparation are often overlooked by many roofing contractors serving Petaluma, but Sutter Roofing and Sheet Metal knows that these finer details are crucial to a long lasting roofing system. If you need roofing in Petaluma, or would like to see what makes our roofing company special, contact Sutter Roofing today at 707-829-5050 or online. You’ll be glad you did, for we are the one-stop leading roofing contractor serving Petaluma!